It sounds straight out of a Frankenstein novel, but Gartner is working to grow the milk-producing tissues of the human breast to create a living, working model of the human mammary gland that grows, ages and responds to hormone signals just like the real thing. This means growing the ducts, arteries and connective tissue in the same environment. “To best of my knowledge, there’s no in vitro model of the human mammary gland that’s fully functional – so being able to build that, to understand how the complete system works, has a lot of value,” said Gartner, a UCSF associate professor of pharmaceutical chemistry who won an National Institutes of Health New Innovator Award in 2013, earning $1.5 million for this research over five years. Currently, much of breast cancer and other research is done using mouse mammary glands, which, as you might imagine, do not fully approximate the human breast. If Gartner succeeds in building a living, functioning organ it will open a whole new world of possibilities, both for basic science research and efforts to create better drugs. It may also lay the groundwork for efforts to grow other organs like lungs and kidneys for transplantation. Unlike studying cancer in a living human being, here researchers can peer into the biomolecular level – prodding and poking the cells to see what signals instruct the cells to form healthy ducts and what conditions lead to cancerous growth. In this system every single component is controllable and measurable, which allows researchers to relate subtle changes at the cellular and molecular levels to profound changes in the behavior of the tissue as a whole. Gartner is not the first to work with living cells toward developing a human organ – but his approach is unique. To date, researchers have successfully mimicked parts of human organs in the lab – like the “lung on a chip” approach, in which scientists layer living cells on a microchip to recreate the lung’s function of transmitting oxygen to blood cells flowing beneath. Other scientists are growing tiny parts of an organ from stem cells. Still others are using 3-D printers with tiny jet heads that can actually print globs of living cells and other materials, arranging them in a 3-D pattern that mimics a real organ. The limitation here is that the 3-D printers are not designed to work with individual living objects like cells. They can only get so small – Gartner said it’s like trying to build with handfuls of legos, but without the ability to put the individual blocks where you want them. The first step for Gartner’s team was determining just how much information you need to give the cells of the human mammary epithelium – the milk-producing part of the human breast – such that when mixed together, they self-organize into the right physical structure. And it turns out, not much. “In many cases, if you use the right cells and get the cells close enough, they will make fine adjustments to their positions on their own,” said Gartner. He says the key is creating the right environment around the cells. This technique – called DNA Programmed Assembly of Cells (DPAC) and reported in the journal Nature Methods on Aug. 31 – is a much more detailed, high-resolution approach than 3-D printing. A cell is about 20 microns wide, whereas 3-D printers typically work with cell blocks and drops of materials hundreds of microns in size, so they’re an order of magnitude larger. But just as important as getting the cells to line up correctly – so the inner luminal epithelial cells of the breast duct line up inside the outer myoepithelial – is getting it to go wrong. The outer lining of myoepithelial cells seem to behave like “cellular sheep dogs” that keep cancer contained. Zev Gartner's lab is looking at what's causing these outer cells to get pushed out of the way or even disappear, allowing cancer cells to invade surrounding tissue. That’s because cancer results from mutated cells that don’t line up correctly. By understanding what conditions disrupt normal tissue self-assembly, scientists can better understand what causes cancerous growth – and how to stop it. For many dangerous invasive breast cancers, it’s often the luminal epithelial cells that are mutated, the ones lining the inside of the duct. The outer myoepithelial cells are rarely mutated. Therefore, invasive cancer occurs when these inner lining cells break out of the ducts and invade the surrounding tissue. 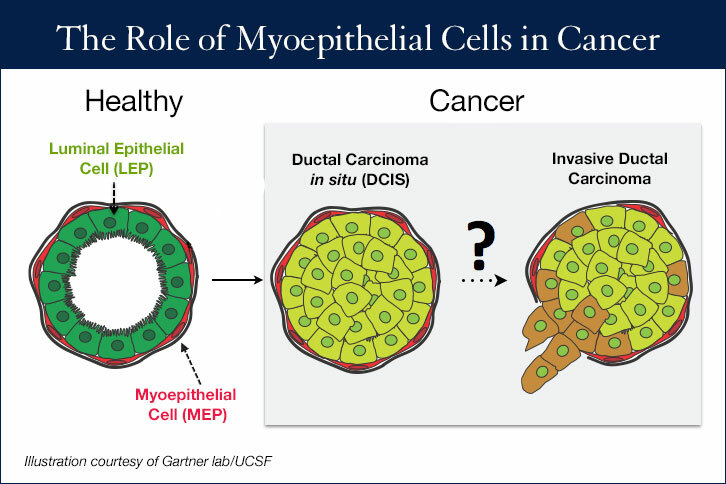 Gartner says that many scientists believe the outer lining of myoepithelial cells behave like “cellular sheep dogs” that keep cancer contained. So the question becomes, what exactly are the changes occurring to luminal epithelial cells that allow them to force the “sheep dog” outer cells to move out of the way or disappear? Gartner’s lab is using its mammary gland model to test different conditions to answer that question. How Far to Growing A Complete Organ? A couple years into the NIH Innovators grant, Gartner has made big strides. But understandably, he’s still many years from building a complete functioning human mammary gland. His lab has made huge strides in growing the ducts, but ultimately he wants to have his living breast tissue model respond accurately to human hormones, including lactogenic hormones along with estrogen and progesterone. Gartner said that if his lab succeeds in putting together a fully functional model for the breast beginning with dissociated cells, then the lessons learned are going to be applicable to other organ systems. Some day down the road, advances in stem cell technology – pioneered by researchers such as UCSF’s Sheng Ding and Matt Thomson – could allow scientists to extract patient’s tissue, process it into stem cells and ultimately to rebuild tissue and organs in such a way could be transplanted back into people. This could solve many problems with the immune system rejecting foreign organs, and open new doors for understanding the development of human biology.